dealership say they are still on the hook for trade-ins that were supposed to have been paid off months ago. MESA, AZ — Customers of a Valley car dealership say they are still on the hook for trade-ins that were supposed to have been paid off months ago. Chris Haskins traded in his SUV for a brand new Dodge Ram pickup truck from Heggs Chrysler Dodge Ram in Mesa. According to the contract, Heggs would pay off the remainder of his loan and roll it into a new deal with them. That was in August of 2018. He says they made a September payment. But by November he says he started getting phone calls from the lien holder about being past due. "In a couple a days (it) dropped my credit to over 100 points," he says. He started called the dealership but says calls were "either transferred or dropped." Haskins says messages and e-mails went unanswered until he filed a complaint with the Better Business Bureau (BBB). "They probably responded about three weeks later saying they thought they sent the check," he says. But he says nothing changed. "No letters. No phone calls. No emails," he says. Jody Ladd in Kingman also traded in a vehicle. She turned over her Jeep to Heggs in November of 2018. "The December payment came and went, and came out of our checking account--still no payoff," she says. "(We) contacted our salesman he was very blunt in saying that he doesn't do licensing and he doesn't do payoffs," she explained. Ladd stretched her budget to pay both payments for her new truck and the Jeep that she gave to Heggs. "I felt like they stole my Jeep," she says. 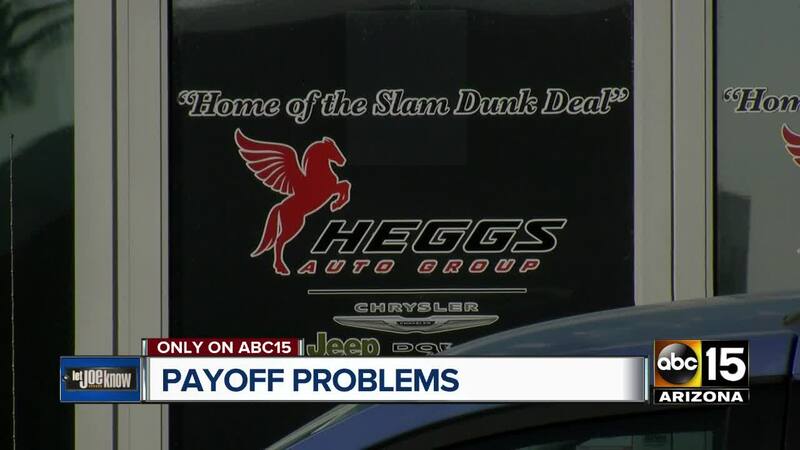 We've heard from several Heggs customers around the state who say their payoff was either extremely past due or just never happened. We contacted the dealership and a few days later we received a call from Heggs Automotive Group owner Alvin Heggs. He explained that he received a "lucrative offer to sell the dealership," and the decision was made to "put certain things on strategic payment." He did not elaborate on what that means but said that out of the 3,500 vehicles the dealership sells each year, "less than 60 people need to be paid off." Heggs also said that the contract gives the dealer 30 days to payoff and it could take 60 days to show up. Let Joe Know could not find that language in the sales contract. There is no law to specifically protect consumers in this case. Consumer attorneys tells us the industry standard is a 10-day payoff. But to enforce any part of a sale contract consumers will likely have to spend even more money and sue. Heggs agreed to sit down with Let Joe Know for an on-camera interview to answer our questions. The next day he canceled citing advice from his attorney. We showed up hoping he'd change his mind and give customers answers to the questions they've been asking for months. He was not there. "As we look to secure adequate financing for the dealership, my hands have been tied while I work alongside Fiat Chrysler Automobiles (FCA) in search of the ideal solution. As you can imagine with manufacturer agreements, floor plan financing, and other numerous, complex agreements - this is a tall order. In doing so, we are looking for a solutions based result that does not simply fix the “now” but ultimately better positions Heggs Auto Group for many years to come. This pains me because ultimately, I know the hurdles the dealership has faced has resulted in difficult situations for a few of our customers - the lifeblood of our business. Heggs Auto Group will work tirelessly to address each issue as it comes to our attention and resolve the matter as efficiently as possible." After Ladd filed a dispute with her credit card company for the amount that she spent on her down payment, she says Heggs started moving. "They needed to do some back tracking pretty quick," she says. Heggs sent her a check for the two payments she made on the Jeep she traded-in and for registration fees she paid for but never received. The payoff would come a few weeks later. Chris Haskins hasn't been as lucky. His trade-in was paid off more than 4 months after the deal and his credit score has dropped by nearly 200 points. "I'm kinda stuck. I mean I don't know what to do," he says. So how will Heggs completely restore customer's credit scores? He tells me the company has retained a credit counseling law firm to help with that. That firm was not able to confirm to ABC15 whether or not Heggs is paying for any clients to use them. Also it is unclear how a credit counseling firm would correct these particular credit problems. Haskins is still deciding what his next step will be. "I could sue but a $5,000 retainer fee, couple hundred dollars an hour, and it could go on for a while," he says. When buying a car if you can't payoff the loan yourself, make sure to turn over the vehicle after your most recent payment. That will give the dealer another month to come up with the cash. You may also want to use a credit card for a portion of the down payment to give you some leverage like Ladd had. Are you waiting for a payoff or have had your credit ruined while waiting? Let me know.